Canning Tomatoes for Sale! 20-lbs for $20! Posted 7/21/2017 12:00pm by David Paulk. Posted 7/14/2017 9:54am by David Paulk. Beat the heat with a cool, crisp personal-size watermelon! And of course, we have sweet corn, tomatoes, sweet peppers and plenty more of great summer vegetables for your cookouts, including some new veggies this week (check out what's new below)! Please see photos below and simple recipes at www.sassafrascreekfarm/recipe. - Watermelon (New! 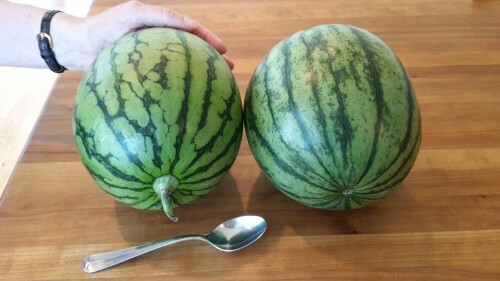 ): Sweet, icebox (personal-size) watermelon! See photo. - Potatoes, Blue & German Butterball (New! ): Two new varieties of tasty irish potatoes. The blue potatoes are blue inside and out, full of anti-oxidants, and great for making crispy fries or roasting. German Butterballs are a creamy yellow/white and great for boiling, roasting or making mashed potates. And we still have our delicious Mt. Rose (red) potatoes, which are very versatile. - Rolled Oats (Oatmeal) (New! ): Like last year, we are selling rolled oats from oats grown on our farm. They have a wonderful nutty flavor. and are certified organic, like all of our produce! - Shishito Peppers (New! ): Japanese appetizer peppers that are delicious and easy to prepare. Just toss the whole pint of peppers into a skillet of olive oil, on medium heat; saute until they shrivel and char, just slightly. Drain peppers onto a paper towel and then plate up with a sprinkle of sea salt, served with an ice cold beer or dry white wine. Eat the whole pepper, except stem. Maybe 1 in 10 have some heat, but a mild heat. Enjoy! - Sweet Corn: Yes, we have delicious, freshly harvested certified organic bi-color sweet corn! See photo. 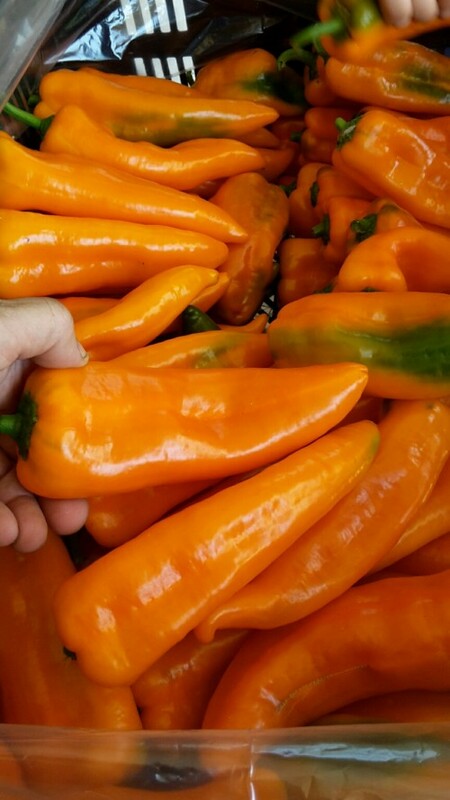 - Oranos Sweet Orange Peppers: Bright orange, shiny and sweet. So, good raw or grilled! We have more this week. - Red Potatoes: If you've never had freshly harvested potatoes, now's a good time to try them. The flavor is soooo good! Try simply boiled until just fork tender with butter, or cook them up with green beans (which we have) and maybe add a little bacon from one of our meat vendors. The combination of fresh potatoes and grean beans is delicious summer comfort food. - Zucchini, Zephyr and Yellow Summer Squash : More this week! Perfect for your grilling! - Tomatoes, Heirloom and Red Slicers: We have delicious German Johnson heirloom and traditional, red slicing tomatoes. We have a lot this week! See photo. Posted 7/7/2017 4:22pm by David Paulk. We are into the swing of summer now with hot days, barbecues and cool salads. We have plenty of your favorite summer veggies to choose from to make your weekends and weekday meals special, tasty and healthy! BIG NEWS is we have a ton of sweet corn, zucchini and tomatoes this week! Please see photos below and simple recipes at www.sassafrascreekfarm/recipe. - Beets, Red: Great either boiled or roasted, like a potato. The perfect combination is beets with goat cheese and walnuts on a bed of arugula! - Carrots: Freshly harvested, crisp carrots! - Green Beans: It's the first flush of tasty green beans for your spring salads. Think Nicoise with beets, carrots, green beans and Swamp Foxes' eggs, hard boiled. Wow! Also try with our new red potatoes! 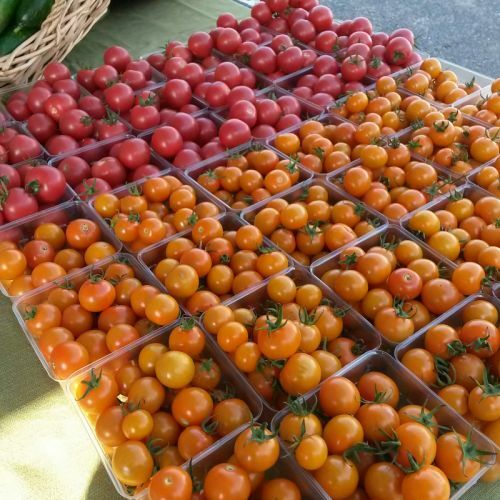 - Tomatoes, Heirloom and Red Slicers: We have delicious German Johnson heirloom and traditional, red slicing tomatoes. We have a lot this week! Corn so Sweet...We can't wait to Eat it! Posted 6/30/2017 5:50pm by David Paulk. Happy 4th of July weekend! We know many of you are staying in the area to celebrate the day we told Dear Old England to essentially bugger off! What better way to commemerate our independence than by grilling meats and veggies with family and friends! Well, we have just what you need for the grill and for fresh, cool salads. We'll have sweet corn, zucchini, zephyr and yellow summer squash, more tomatoes, sweet peppers, beets, carrots, cucumbers, lettuce, wonderful sweet superstar onions, and more! We usually have a little something else new for the early bird! Rain is not expected until after the market. Please see photos below and simple recipes at www.sassafrascreekfarm/recipe. - Super Sweet Superstar Onions (New! ): If you've been to our stand over the years, then you know these super sweet onions! They are large, white and very similar to vidalia onions. They are sooo good raw on burgers, in salads, or sauteed until caramalized. Make sure you cook them on a med-low heat, because the sugars in them can burn if too hot. - Oranos Sweet Orange Peppers (New! ): Bright orange, shiny and sweet. So, good raw or grilled! - Beets, Red, Chioggia and Golden: These are probably the most beautiful beets we've ever grown. Conditions have been just right for them. Plus, they taste amazing! Three sweet beets to choose from: traditional Red, Italian Chioggia and the beautiful golden. All are great either boiled or roasted, like a potato. The perfect combination is beets with goat cheese and walnuts on a bed of arugula! 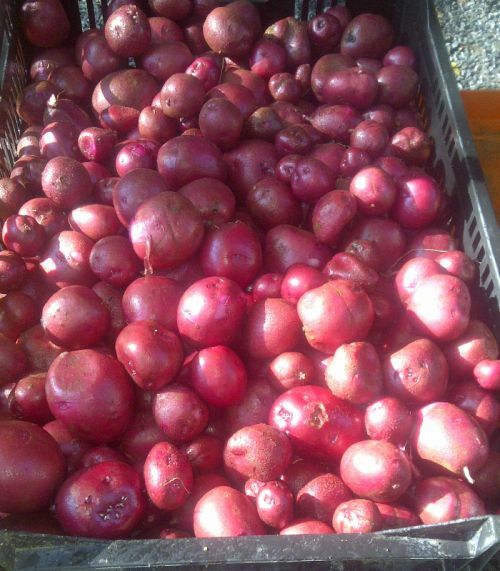 - New Red Potatoes: If you've never had freshly harvested potatoes, now's a good time to try them. The flavor is soooo good! Try simply boiled until just fork tender with butter, or cook them up with green beans (which we have) and maybe add a little bacon from one of our meat vendors. The combination of fresh potatoes and grean beans is delicious summer comfort food. - Fresh Shallot bunches: Fresh shallots in bunches for you! Your used to seeing them driece. Well these are fresh, sweet, mild and have amazing tasting. Try sauteed with our green beans or summer squash. 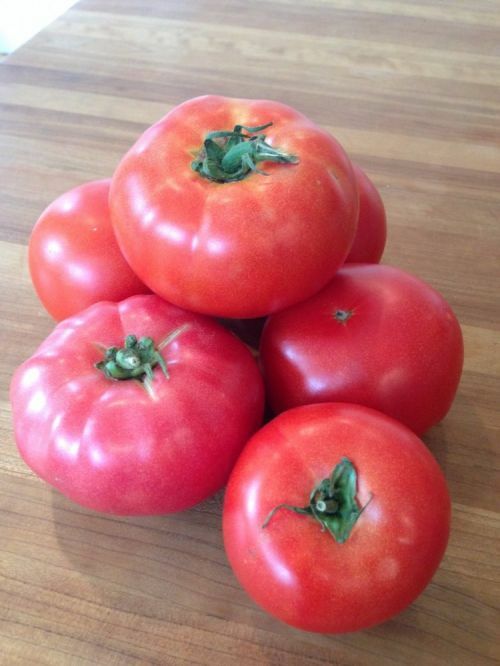 - Tomatoes, Heirloom and Red Slicers: We have delicious German Johnson heirloom and traditional, red slicing tomatoes. We have more this week! Posted 6/23/2017 4:12pm by David Paulk. Three weather apps predict that the rain is going to miss the market! Even BETTER NEWS is that we will have carrots again! Plus, we'll have sweet corn, garlic, new red potaotes, sunflower bunches and much more! Photos below and simple recipes at www.sassafrascreekfarm/recipe. - Carrots (Back! ): Freshly harvested, crisp carrots are back! 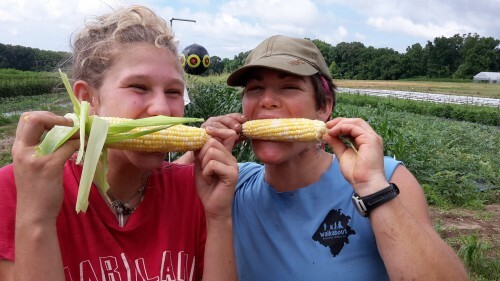 - Sweet Corn: Yes, we have delicious, freshly harvested certified organic bi-color sweet corn! - Sunflowers: Beautiful, bright yellow, pollenless, sunflower variety that florists use in arrangements. Periodically recut ends and refresh water. Holds for over a week. Posted 6/16/2017 4:17pm by David Paulk. We have more of your favorite late spring/summer vegetables now that the heat is starting to crank up. The nights have still been relatively cool and allow us to still have chard and kale, but are slowing the ripening of tomatoes. The BIG NEWS is that we'll have sweet corn, fresh garlic and new red potaotes! AND for the first time ever, Sunflower Bunches! 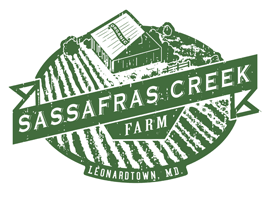 Please see recipes for all of our produce at www.sassafrascreekfarm/recipe. - Sweet Corn (New! 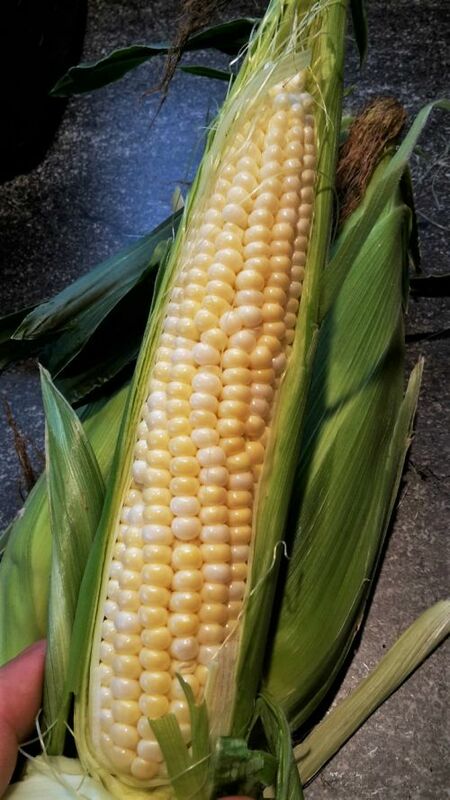 ): Yes, we have delicious, freshly harvested certified organic bi-color sweet corn! - Fresh Garlic (New! ): We decided to bring some garlic to the market early! We'll have some fresh for sale now and and some in about 3 weeks that's cured, for the rest of the season until we run out. Fresh garlic is so aromatic and so easy to mince! Try some today! - New Red Potatoes (New! ): If you've never had freshly harvested potatoes, now's a good time to try them. The flavor is soooo good! Try simply boiled until just fork tender with butter, or cook them up with green beans (which we have). The combination of fresh potatoes and greans is delicious summer comfort food. - Lettuce, Green Leaf and Summer Crisp (New! ): For your summer salads, lettuce, one frilly and one crisp, and both tasty! We still also have romaine and salad mix! - Sunflowers (New! ): We thought this year we'd offer some sunflowers. These are beautiful, bright yellow, pollenless, sunflower variety that florists use in arrangements. 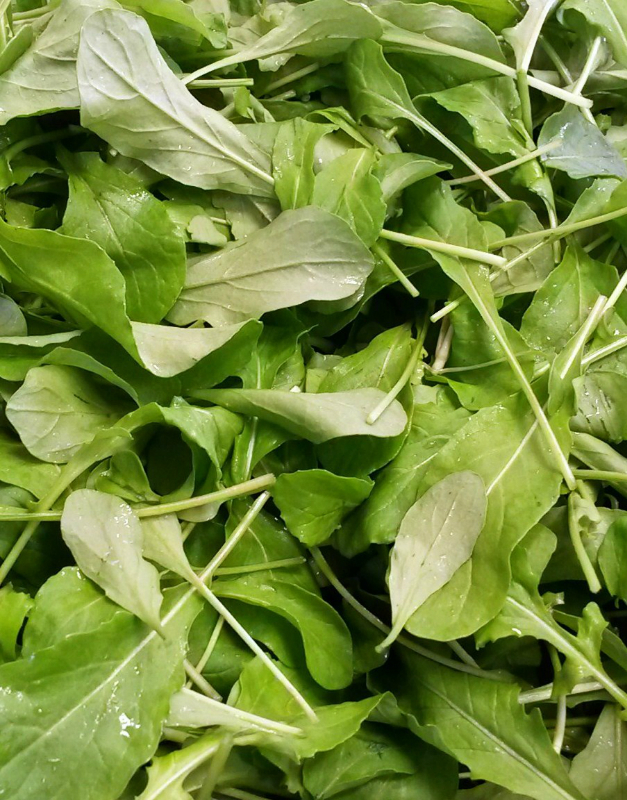 - Basil: Fresh, intoxicatingly aromatic Italian basil. Great on pizza, on sandwiches, in salads and of course as pesto!. See our pesto recipe on our website. - Rainbow Chard: Beautiful, glossy leaves and colorful stems. They have just as many nutrients as kale. Simply sautee some sweet red onions first and then add the chopped leaves, along with the the sweet, crunchy stems! Makes a great side dish! - Lettuce, Romaine: It's the perfect time of year to enjoy fresh, crisp romaine lettuce in a caesar salad. - Fresh Shallot bunches: Fresh shallots in bunches for you! Your used to seeing them driece. Well these are fresh, sweet, mild and have amazing tasting. Try sauteed with our green beans, summer squash, kale, or chard. - Spring Salad Mix: Convenient, delicious and ready to eat salad. Perfect blend of red and green butter heads and oakleafs. 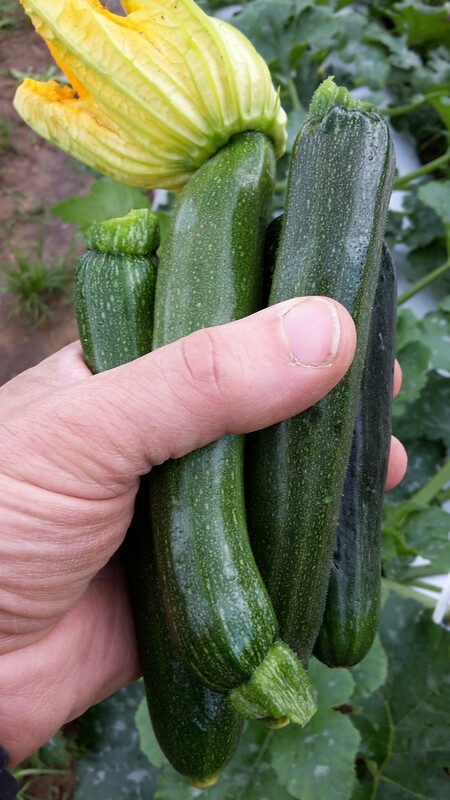 - Zucchini, Zephyr and Yellow Summer Squash : More this week! The first summer squash of the season! Perfect for your grilling! Posted 6/9/2017 3:39pm by David Paulk. It's going to be a hot one on Saturday, so get your crisp, cool lettuce, salad mix, and other wonderful spring veggies while they last! We have the start of summer veggies too --- A LOT of Zucchini and summer squash already! We so look forward to seeing you, your family and friends tomorrow! See Photos of the Week at bottom of email! - Basil (New! ): Fresh, intoxicatingly aromatic Italian basil. Great on pizza and in sandwiches. Make a pesto using our garlic scapes! Just follow the garlic scape pesto recipe and then throw in as little or as much basil as you want for added flavor. - Cucumbers (New! ): First of the season! Limited quantity. - Beets, Red, Chioggia and Golden: These are probably the most beautiful beets we've ever grown. Conditions have been just right for them. Plus, they taste amazing! Three sweet beets to choose from: traditional Red, Italian Chioggia and the beautiful golden. All are great served boiled (peeled, then slice) or roasted. Peel your beets, cut into thick slices and coat with a little olive oil and grill over indirect heat OR don't peel first, cut your beet in half and wrap in foil and roast over the coals. Once cool just rub off the skin with a paper towel. Sooo good with goat cheese and walnuts sprinkled on top or add all of the above to a bed of lettuce! Deelish! 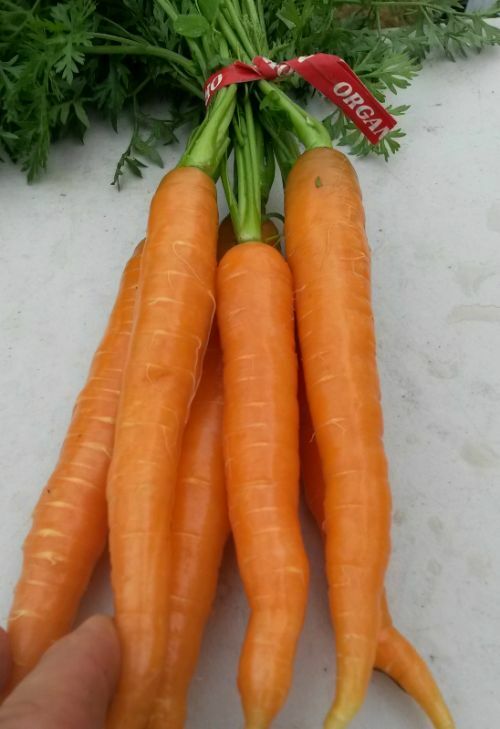 - Spring Carrots (limited quantity): Fresh, aromatic, crisp carrots. Wonderful lightly roasted, steamed, boiled or sauteed with a little butter. Also tasty grated into salads for fresh carrot flavor, color and nutrients. 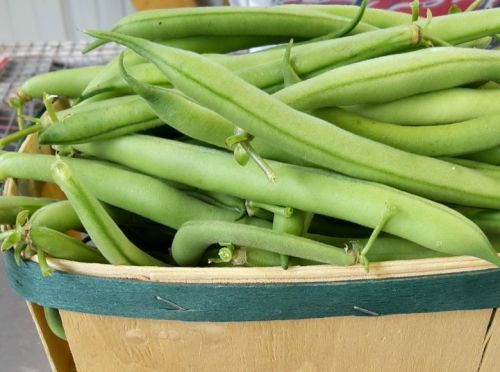 - Green Beans: It's the first flush of tasty green beans for your spring salads. Think Nicoise with beets, carrots, green beans and Swamp Foxes' eggs, hard boiled. Wow! - Lettuce, Bibb & Romaine: It's the perfect time of year to enjoy so delicious, buttery bibb lettuce that is perfect for making a delicate spring salad or to use in wraps. It is also a great time to enjoy fresh, crisp romaine lettuce in a caesar salad for your Memorial Day weekend salads. - Shallot bunches: Fresh shallots in bunches for you. They are sweet, mild and amazing tasting. Try sauteed with our green beans, summer squash, kale, or chard. - Zucchini and Yellow Summer Squash : The first summer squash of the season! Perfect for your Memorial Day grilling! Posted 6/2/2017 6:36pm by David Paulk. It's going to be a lovely day for market tomorrow! Sunny and 70's! We'll have plenty of late spring veggies for you, such as plenty of beets (3 kinds), carrots, green beans, onions, fresh shallots, more arugula, zucchini and yellow summer squash, for example. See Photos of the Week below! - Fresh Shallots (New! ): Yes, shallots fresh, straight from the earth to you. Okay, we did wash them. They are sweet and amazing tasting. Try sauteed with our green beans, kale, or chard. - Green Beans (New! ): It's the first flush of tasty green beans for your spring salads. Think Nicoise with beets, carrots, green beans and Swamp Foxes' eggs, hard boiled. Wow! - Spring Carrots (Also Back! 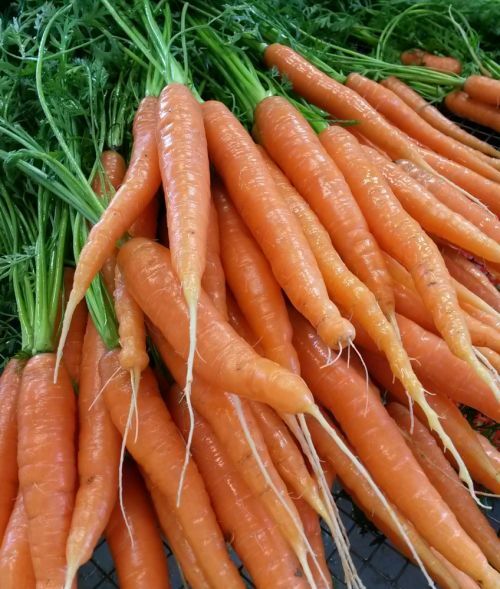 ): Fresh, aromatic, crisp carrots. Wonderful lightly roasted, steamed, boiled or sauteed with a little butter. Also tasty grated into salads for fresh carrot flavor, color and nutrients. - Beets, Red, Chioggia and Golden: We have plenty of beautiful beets this week. We sold out pretty quick last week. We have lots more this week. These are probably the most beautiful beets we've ever grown. Conditions have been just right for them. Plus, they taste amazing! Three sweet beets to choose from: traditional Red, Italian Chioggia and the beautiful golden. All are great served boiled or roasted. Peel your beets, cut into thick slices and coat with a little olive oil and grill over indirect heat OR cut your beet in half and wrap in foil and roast over the coals. Once cool just rub off the skin with a paper towel. Sooo good with goat cheese and walnuts sprinkled on top or add all of the above to a bed of lettuce! Deelish! - Summer Squash, Yellow and Zucchini: The first summer squash of the season! Perfect for your Memorial Day grilling! Posted 5/26/2017 1:39pm by David Paulk. The weather continues to keep us on our toes! We had quite a violent rain/hail storm event on our farm yesterday afternoon! Hail is a farmer's worst nightmare, but we think our healthy, young veggies will recover. 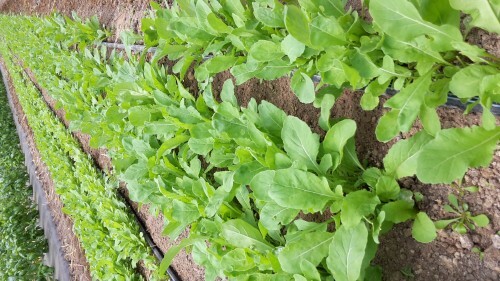 We will have some Romaine lettuce with a little cosmetic damage from the hail, but otherwise looks and tastes great! At market tomorrow, we will have pleasant temperatures in the upper 60's/low 70's AND NO RAIN until after the market. So, please pay us and our other wonderful vendors a visit at the market tomorrow! It's a win-win....Support your local farms and get fresh, tasty organic produce for your Memorial Day Weekend cookouts! See Photos of the Week below! - Summer Squash, Yellow and Zucchini (NEW! ): The first summer squash of the season! Perfect for your Memorial Day grilling! - Beets, Red, Chioggia and Golden (NEW! ): These are probably the most beautiful beets we've ever grown. Conditions have been just right for them. Plus, they taste amazing! Three sweet beets to choose from: traditional Red, Italian Chioggia and the beautiful golden. All are great served boiled or roasted. Peel your beets, cut into thick slices and coat with a little olive oil and grill over indirect heat OR cut your beet in half and wrap in foil and roast over the coals. Once cool just rub off the skin with a paper towel. Sooo good with goat cheese and walnuts sprinkled on top or add all of the above to a bed of lettuce! Deelish! - Tomato Plants (NEW! ): We will have our xtra heirloom (German Johnson) and cherry (Sungold) organic tomato plants for sale at market! - Hakurei Turnips: delicious raw, roasted or sauteed! And don't forget the Turnip Greens, a very Southern delicacy! Simply sautee the greens with some sweet red onions or add a little crumbled bacon! Yum!! Posted 5/19/2017 7:21pm by David Paulk. It will be a warm, sunny day at market. A considerable contrast from the last market! The weather has been so confusing lately -- cold and wet, then hot, then cold, hot,...our plants are not sure what to do! But they and we have persevered and will offer a beautiful display of colorful, fresh, nutritious organic vegetables for you. We still have some strawberries, maybe not quite as many as last week, but we have some new items too! 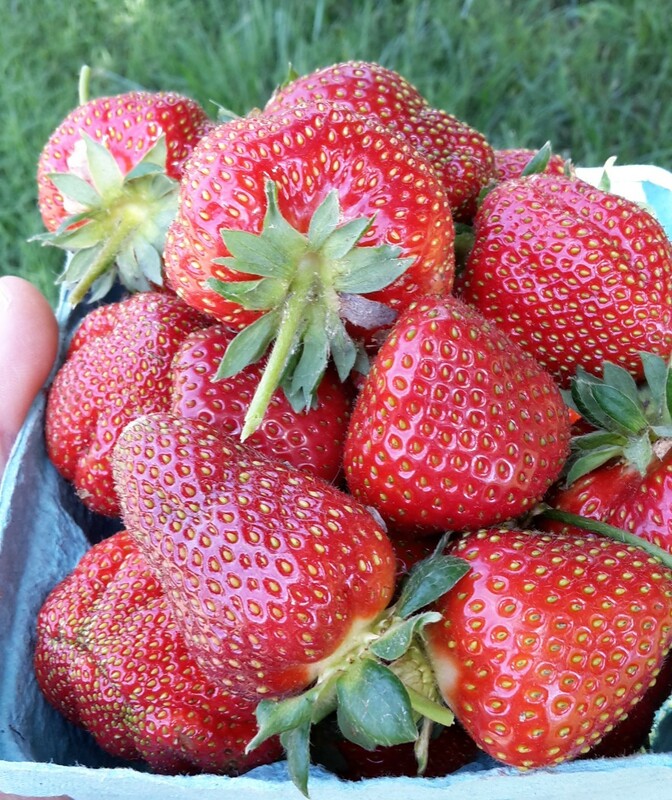 - Strawberries (Still have, but not as much): We have fresh-picked, red, sweet, organic strawberries for you to enjoy. These are the first flush of the season and are in limited quantity. See photo below. - Red Onions (New! 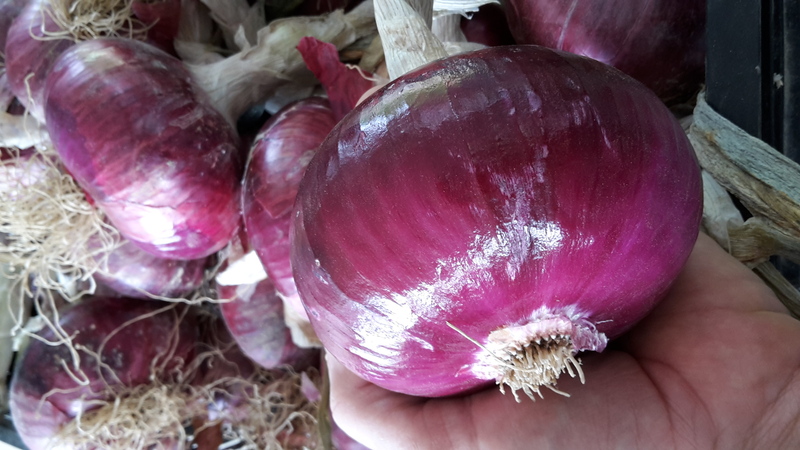 ): Freshly harvested sweet red onions that are so versatile and great in any dish. 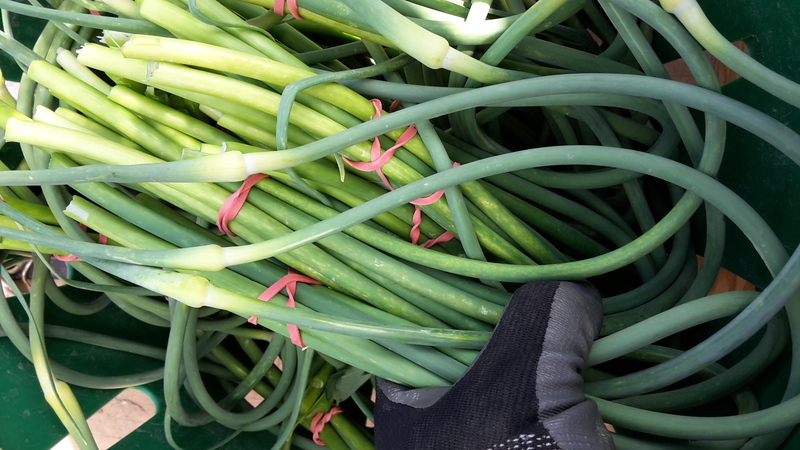 - Garlic Scapes (New! ): Try these delicious, garlicky green shoots sautéed with sscrambled eggs, veggies or as a pesto! Ask at the market! - Lettuce, Bibb & Romaine: It's the perfect time of year to enjoy so delicious, buttery bibb lettuce that is perfect for making a delicate spring salad or to use in wraps. It is also a great time to enjoy fresh, crisp romaine lettuce in a caesar salad. - Hakurei Turnips: delicious raw or cooked. And don't forget the greens.